Saturday night at Crown Casino is not for the faint hearted. There are no parking spaces and lots of teenagers. And promo girls. It’s like entering a shopping mall that never closes. Ever. 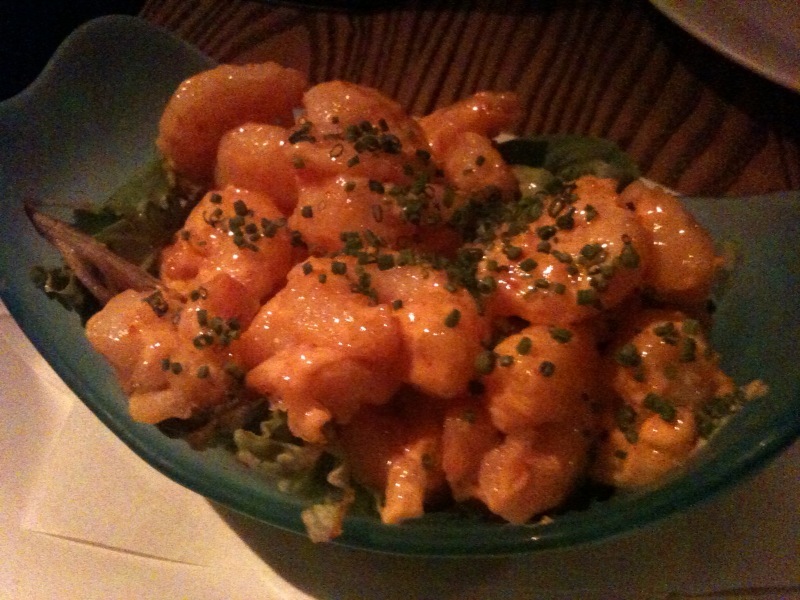 Still, we brave the crowds and arrive early for our late-sitting at Nobu. We plan on having a cocktail in the bar – but our table’s already free, so we head down straight away. As luck would have it, we are shown the least well-lit table in the room (so apologies in advance for the shadowy pics). We are given the menus – and the spiel. You can order a la carte – but they recommend naming your price per head and letting them choose your dishes. Or going with one of the set-price set menus. But you get the feeling that ordering for yourself would be more fun. So we go a la carte and pick the dishes that appeal to us most, plus a glass of wine to start. It takes close to 20 minutes for the first dishes to arrive. Which would be fine, except that our wines haven’t turned up and we’re forced to remind the wait staff we’re still um, waiting? 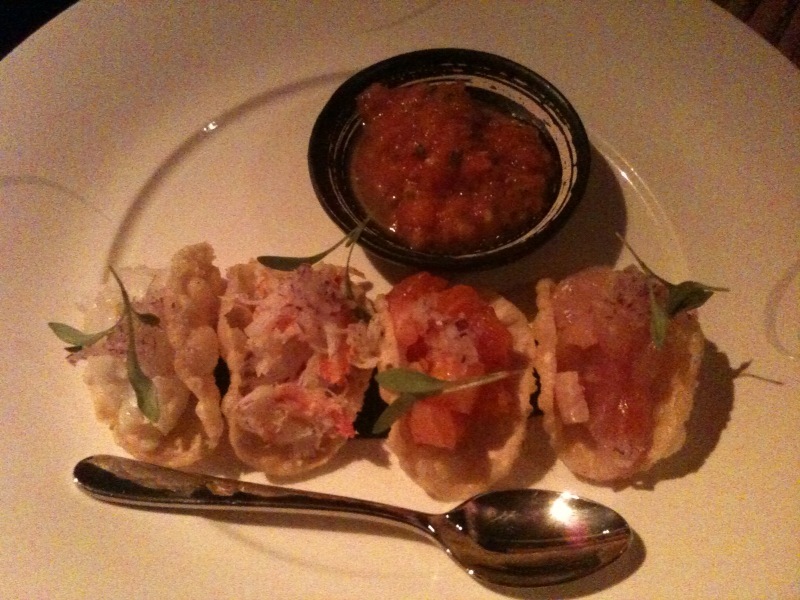 By the time our wines arrive, we’ve had: sashimi tacos of yellowtail, salmon, lobster and crab (nice – liked the side of salsa very much) and baby tiger prawn tempura with creamy spicy sauce (also good – generous with the portion size, although a bit too light on the tempura?). All is forgiven when the crispy soft shell crab arrives. 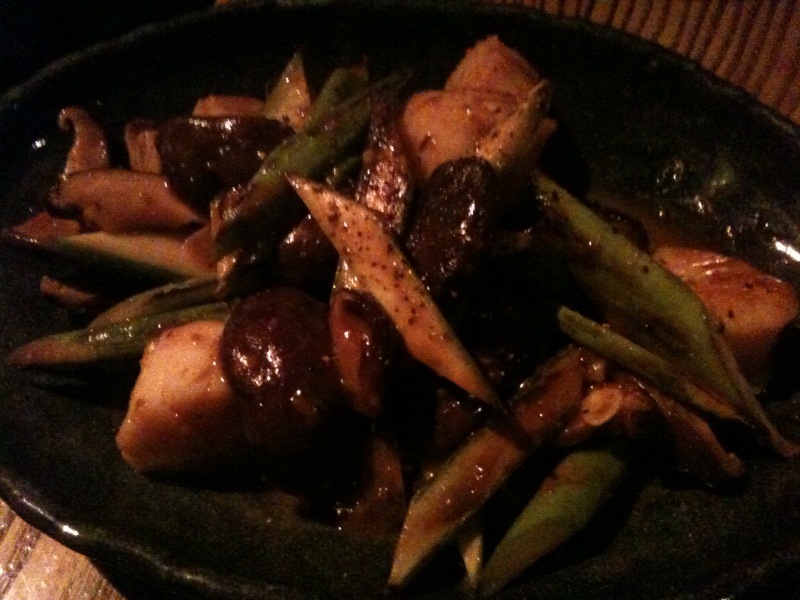 This is my favourite dish – the pineapple shiso ponzu is delicious and absolutely makes it. 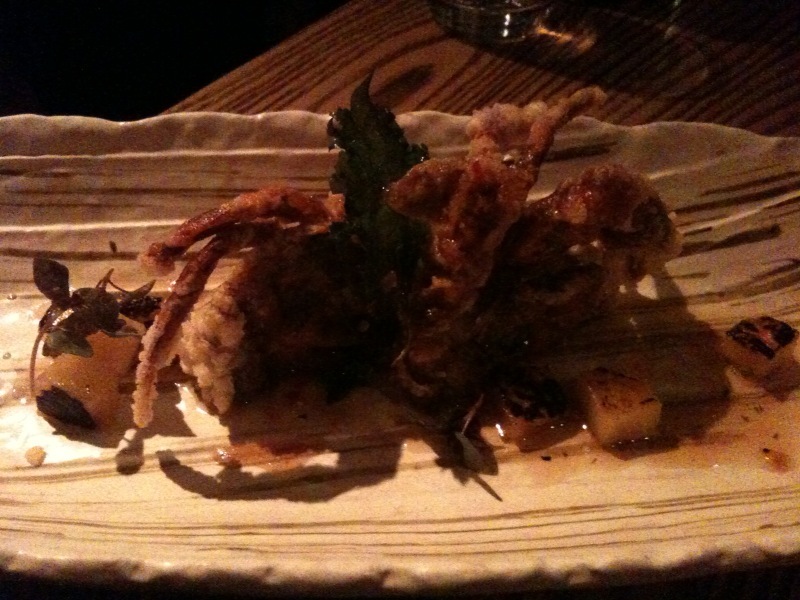 Soft shell crab with shiso ponzu - dish of the day! 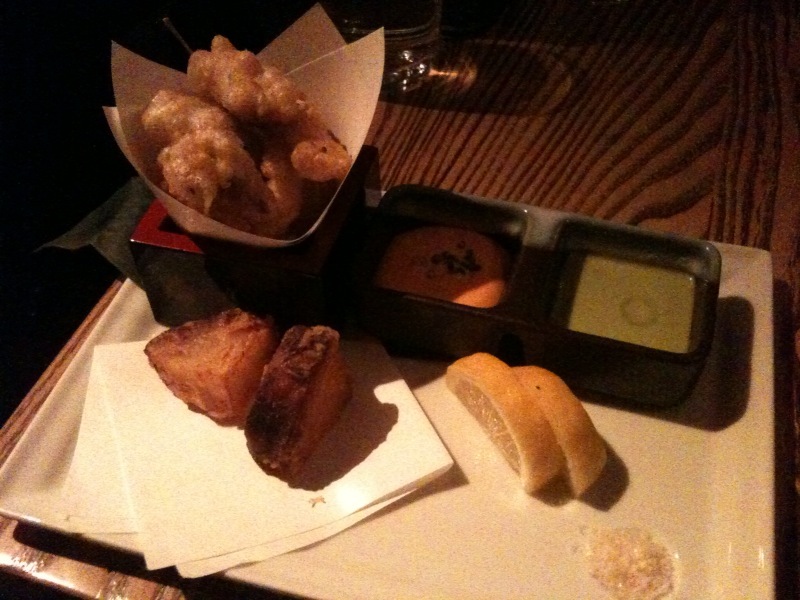 Next comes the very pretty ‘Nobu style’ fish and chips – five pieces of tempura cod with two chunky sweet potato chips, plus two very yummy dipping sauces. This one is a winner too. 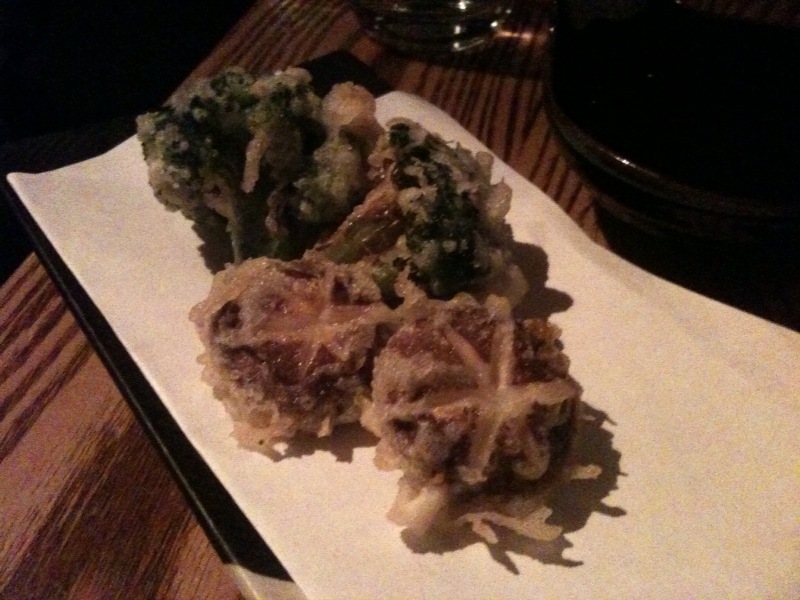 These are followed by scallops, some tempura vegies (shitake mushroom and some suprisingly awesome broccoli) and tuna sashimi. N. loves the scallops and in particular the wasabi pepper sauce. 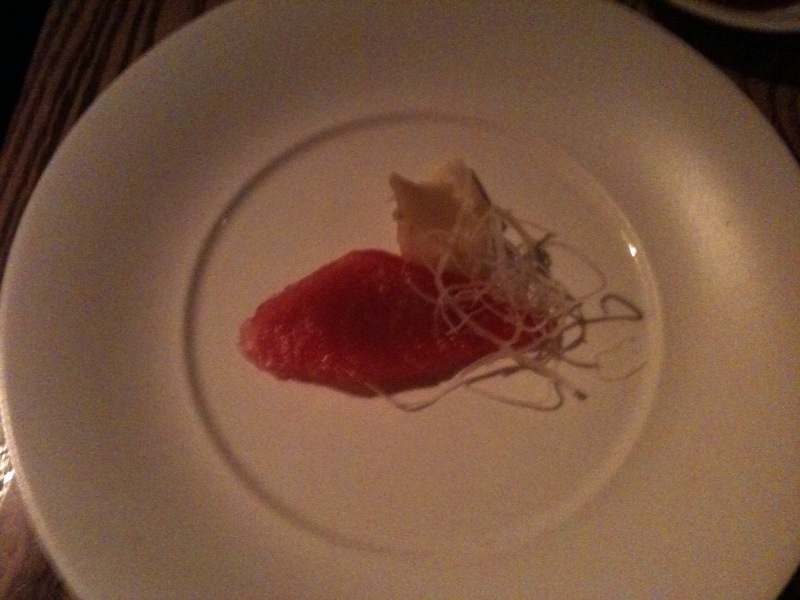 And the tuna sashimi is pretty hard to fault. Seven courses down and I feel we’ve ordered well. We keep the hat-trick going with dessert, choosing the bento box with hot chocolate fondant, green tea ice cream and a goma tuile. Although I think the waitress forgets to place our order, as she comes back 15 minutes later to ask, was it the caramel marshmallow dish we were after? We correct her and the bento box arrives soon after. It’s so pretty – and it tastes as good as it looks. 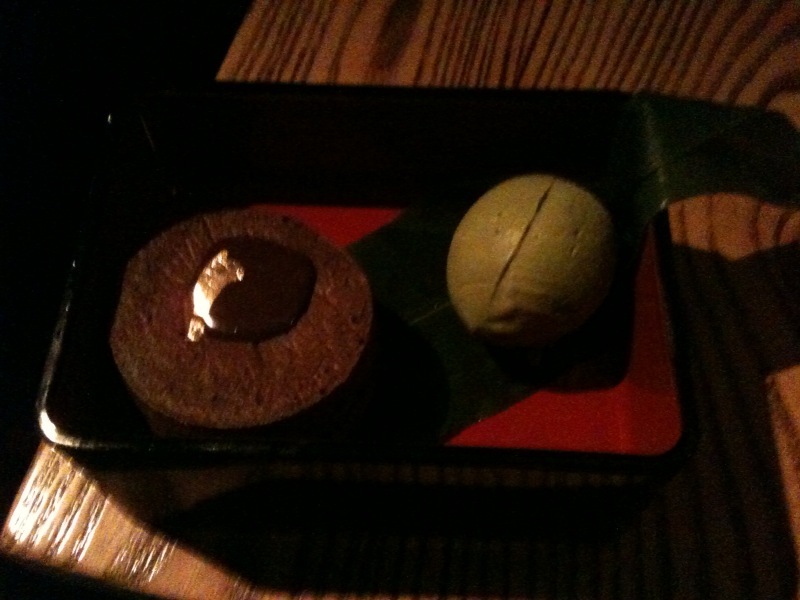 Lovely spoonfuls of warm and runny fondant coupled with refreshing green tea ice cream – delish. We almost misplace the tuile what with the low lighting and all, but thankfully I’m diligant enough to scrape the bottom of the bento box before we’re done. Crisis averted. We manage to put away eight courses and three glasses of wine (not to mention our Fijian water at $12 a bottle) and the bill comes to just over $100 a head. While I can’t fault the food – it is consistently good – the service isn’t of the same standard, which is a shame. But as we finish up, the extra-late sitting keeps coming in. Clearly, when it comes to Crown, the house always wins.